Have another solution to unlock a Mac with a long forgotten firmware password? Let us know in the comments. Thanks for teaching criminals how to reset our security options. Please, consider taking this post down. It was quite inconvenient on your part. Please read the article to understand this is not a risk, to reset the firmware password you need proof of ownership provided to Apple or an Apple Authorized Service Provider. A criminal would not have that documentation (like a receipt in your name and the computer registered in your name, for example). A quick google search can find any of this information from any number of other web sites. These tips are no secret by any means. If you think this is teaching criminals, then you know nothing about cyber threats and are a tool for thinking it. There is more than enough out there in the normal and dark web that will teach you a lot more than this simple trick to unlock a computer. This is a baby step. The real fun is when you can do more than that remotely. If you are that worried about your computer, then don’t take it anywhere otherwise anyone is at risk. Learn before you show how ignorant you are for the whole world on the web can see. Thanks for making ridiculous assumptions and wasting this servers disk space. Having to read your crap was “quite inconvenient on” our part. Since the mac needs to be physically in someones hands to do this maybe you shouldn’t leave it in stupid locations? … or for teaching regular citizens how to reset a system password that was set by criminals themselves AFTER the system was stolen and later recovered by police… which is currently the scenario I’m in. proof of ID before it was changed and was returned to me. As my MacBook Pro was out of warranty, and there are no Apple Genius or Apple Authorised dealers within about 90 miles of me, plus I’m 77 with poor health I had to pay to have the the firmware password renewed ( or reset ?) Plus return carriage of £48, about £90 for finding the fault. Thank you Paul for giving instructions in case it happens again. That has to be one of the most narrow-minded ignorant responses to this tutorial and instruction page. Unlike the delusions of what may have been due to years of built-up programming (too much tele-vision), not everyone is criminal (nor as paranoid or judgmental or …pick your word). I remember that using a firmware password disables a Mac’s ability to boot from a drive other than the selected boot drive, thereby making option 1. impossible. Yes you are correct, the article format needs to be clarified and updated if this is causing some confusing, apologies. The first option is how to disable or change the firmware password, and it’s not possible to get there without entering the password – this is mentioned but perhaps not clear as to why (to resolve an erroneous password entry). The second option is how to reset a lost firmware password. Has anyone actually tried this? I’m pretty sure locking the firmware blocks Recovery Mode. Thats what I was going to say….as far as I know all keys are closed off if the firmware password is set. All you can do is hold the Option key down and enter the firmware password. If your in the OS you could boot off another volume with the firmware tool, but that is about it with the new models or call Apple. Like mentioned the older models you could change the amount of memory and reset the PRAM and that usually turned it off. Yes correct, a firmware password is required immediately and no alternative boot modes can be entered. The firmware reset is possible through Apple or removing RAM only. I agree. 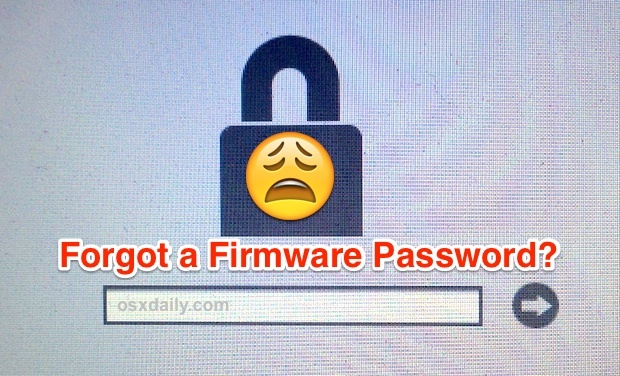 If you install a firmware password you should know the consequences of losing it. Please don’t publish information on how to override it. No, let’s also keep the consequences secret to prevent education. I was given my nephew’s old laptop so I could use it with my band. The kid had been poking around where he shouldn’t have been, set a firmware password, then promptly forgot it. So I received a fancy white doorstop. I even tried pulling the HD, wiping and installing a fresh copy of the OS, then reinstalled it. Waste of time. Do I want to blow money at an Apple Store disabling this password? Not really. The process Apple gives to authorized service providers is a bunch of work. If I remember correctly, they send you some encrypted disk images and a terminal command that you have to use to put it onto a dedicated USB drive. The password they give you is really long, and I think it involves more terminal commands. There’s even more to it than that I think. It’s a lot different than just pulling the RAM. It’s true that having this info out on the internet is kind of sketchy for people with older Macs though. I’m sure you aren’t the only site with it up though. It’s actually quite easy.I work for Apple and scrub Firmware daily.A sbc file is sent to me after I give apple the Hashcode.They email me a sbc file,i apply it with a script to a usb file.Boot the computer.Thats it. Any chance you can help me? I have hashcode Etc. Happy to pay a fee! Any chance you can help me? I have hex code Etc. This is probably a long shot given how old this post is. BUT I’m desperate for some any help please? Chuck your HD into an identical mac with no FW PW. Reinstall osx, then put back into yours. Should boot as normal. Worked for me haha FUAPPLE! I use File Vault. That’s safer. I selected the option to allow Apple to store my decryption key, so if I forget my password, I can get help. I’d love to use Failvault. Really would. We use Symantec Endpoint on our PCs at work and although I know the OS and the hardware is different I can’t help but remember how helpless everybody was when the encryption key was corrupted and I lost the whole drive. I have a different, but similar question. When I attempt to use sudo in the terminal, the reply is enter password, which I don’t have and never remember setting it. In all previous terminal machines this never happened. In many cases, e.g. remove a file from root, or open a downloaded app., or find password in keychain, etc., a password is required, I enter the one I remember with no prob. So a diff. password. The sudo password is the same as your login password. If apple can reset the password, everyone else can. Wen just need to know how to. We bought a Macbook Air on Craigslist and my wife wanted to do a factory reset on it because the previous owner’s info pops up, like their login id and that it is searching for Macbook Pro. When we did the reset the firmware lock appears and we do not have the password. We took it to Apple and they tried to reset but said that we needed to contact the original owner because it is locked down under the original owner’s id. We were given a phone number and I contacted the person and he agreed to pay me what I had paid for it, only when we met it was not the guy I bought it from but someone else. The guy I bought it from had bought it from this guy, who was the original owner. He said he would give me $500 for it because that is what he got from the other guy and then I told him that we paid $775 for it. He said he was sorry and could not do that. I told him all he had to do was call Apple and tell them to reset the password because the case is all logged and ready for him to call. Now he wants to buy the computer back from me for less money than I bought and won’t call Apple. I am being held hostage by this guy. Hey sdpoulter, I wonder if there are enough of us to start a class action suit against Apple. I bought my Macbook Pro a year ago from a doctor who is now out of the country and hard to contact. Two days ago my housemate copied an older Mac OS from a disk onto a thumbdrive on my machine and forgot to remove the disk. My machine evidently tried to boot from the disk and this triggered the firmware lock. I did not set up the lock and don’t know the code. Apple wants proof of ownership that I will not likely be able to provide. I feel the burden of proof is too high and that they have essentially stolen my machine. I’m in the same boat. Bought my laptop secondhand from the owner off of Craigslist. Assuming HE didn’t steal it (there were several reasons for me thinking it was legit, including all the packaging he had with the laptop and our conversation about why he was selling it and the newer version he was going to buy with my cash as well as going onto the Apple Site together to register me onto the Applecare site). Six months later, I hit a combination of keys or did SOMETHING to trigger the laptop to go into recovery mode and now it’s asking me for passcode which Genius Bar says they can’t give me or bypass without receipt from original owner. Of course… my emails and texts to that individual are just past the end of my email and text chains so… I am stuck. For those who are saying “DUH! It’s stolen. This is a victory against theft!” How? Apple won’t tell me who is on the original receipt and they won’t contact that person to find out if their computer was stolen. So… no one wins, everybody loses. And, by the way, I’ve checked the serial code against databases of stolen laptops and it’s not coming up there, so again… I believe this to be a legitimate case of an honest seller and buyer being screwed by overprotection. The person I purchased from I have lost contact with as well. After using for six months mine locked up. I went AGAIN to apple store today hoping for some sympathy or change of position on Apple’s part. Got a big earnest “So sorry, yeah that’s tough.” We could do it with receipt though. Have you had any progress? Last night, Mar 12 2019 (or was it this morning mar 13, 2019? ), I spoke with the police department over the phone which is something this shop does from time to time (to verify our purchases as being the recipients of valid items), the clark county sherrif in Springfield Ohio stated that our serial number for the mac air is not stolen. So your class comprise naive or ignorant users who harm their configuration? BS…this isn;t even something that’d work on an unlocked mc. you’ have no busness here Troll. Beat it! Just do command p when you’re booting the computer up. If i understood it right. Yesterday i saw a movie in my macbook. Today I cant login my macbook.. It doesnt accept actual password+masterpassword. I tried with Apple ID password. Anything didnt work. What can i do..? I donot know about anything of this setteings. I am new to OS system. if you set a firmware password mind that os x lets you set it using whatever keyboard layout is used by you but the firmware password lock itself uses the u.s. extended keyboard layout. that’s especially tricky if you used any symbols like #@€ etc. but also for regular letters that might be situated somewhere else on the keyboard. Maybe you should not have provided admin context to play a movie? The Firmware Lock is hurting second hand buyers more than hurting thieves. I don’t even know the Firmware lock of the computer I purchased at Apple. If/When I sell this computer on Craigslist or to a classmate and that person locks it up on accident – they are screwed. Even if they did contact me to help them out… what a burden. Am I really going to want meet up with them at an Apple Store to verify the situation? The extent of the protection should be – IF your computer is stolen – F-ing REPORT IT STOLEN! If I call Apple and the computer I bought on Craigslist hasn’t been reported stolen then unlock it for me! Hell, charge me, fingerprint me, background check me, make me wait a grace period. ANYTHING! But to say “Sorry, for security purposes, we don’t unlock firmware locks for anyone other than the original purchaser with receipt.” Is close minded. Find a solution for this Apple to protect your customers. “Yes” your customers. A solution to this second hand sale glitch helps the seller and the buyer buy more Apple products. This is very true!! F.. Apple as you’re saying F… Morons!! have to take care of this situation as I know many people (original owners) don’t remember password and don’t have the freaking purchase ticket!! And appl eis only going to say: Sorry!! F.. Up!! I’m running into this same issue, but I know several people in similar tech fields, including Apple employees. Word on the street is that they need the original receipt because there are password bits in the original transaction numbers or something. If you don’t have the verified owner and original receipt they can’t access the password. I am still skeptical. Users can unlock the firmware password as described above, but Apple wants the original receipt because they want proof of ownership, they are not going to unlock the firmware password for a stolen Mac, for example. I have bought my MBP in Turkey, with a Turkish keyboard. To set a EFI password, the system accepted Turkish characters ..( I still know the password) But before I write it, the keyboard becomes American , as default EFI langue …So , my ” true” password is not accepted, coz of keyboard problem..
Is it my fault??? Did any message apeared to say this to me before I set the pasword?? Of course, not…. I now have a dead machine that costed me 1400 USD..Also I’m far away from where i Bought it ..4000 miles..
Apple is not a friendly company…And that was the last apple product I buy..
PS: I have lost proof , or documents they give me when I bought it ..
Hmmmm if you go to buy a MBP you should probably learn to check to make sure they clean and rest the computer so that its a clean slate for you before you buy it and that includes the EFI.. Duh and if your going to set a password using a different keyboard .. Your fault duh think… Ahead.. Use some common sense.. Your all just crying after the s**t hit the fan.. My god ofc Apple won’t unlock it for you how do they know it’s not stolen even if you legibly bought it off somone else … Again it gets back to the seller who wants to sell it and buyer.. Need make sure things are clean. @Paul…why so condescending? There are many honest ppl trying to purchase expensive products secondhand. To think everyone is stealing is more of a reflection of yourself….duh. If I press Comand R, it shows Firmware pass. The problem is my sister forgot it. This device is my only home and work computer. I need to get it back. If you are seeing “panic (cpu 0 caller)” it is due to a kernel panic on boot. You can try rebooting the Mac into Safe Mode (hold down Shift key on boot) and see if that helps, if so it may be a kernel extension or system plugin that is causing the problem. The Console app can sometimes help to locate the problematic issue, find the kernel panic in the Console log and look for what was running immediately before it, it can sometimes be telling. It’s also possible that you may need to reinstall OS X if the kernel panic persists on the Mac. Rarely, it could be a hardware issue causing the kernel panic, like a component or some other accessory. Bought my macbook pro on ebay.. a few years later it just happens to lock by itself. Took it to an apple store, and same thing happened to me. They told me they want proof of pucrchase such as the original owners reciept. My cousin try to unlock it but couldnt… all he ran into was this proplem. “Firmware password”. Can some one help me???? Clearly apple is incentivizing you to sell on craigslist to make it someone else’s problem. Several people mentioned that “all of a sudden, after years of normal use, the computer just locked itself”. How is that possible? What exactly do you have to do to have a normally working Mac just “lock itself”? I am asking seriously, not ironically. I’ve bought several used Macs on eBay and through classifieds, and never thought to ask about firmware passwords. Weird. P.S. got to this discussion from website where I was checking serial number on Macbook Pro on eBay. Folks at the website sell a little USB device with LED display that they say reveals the firmware password on boot. Device costs a LOT. P.P.S. GREAT point by person who pointed out that firmware password (same thing on PC) is entered “blind” and using USA keyboard. Very important to remember. I’ve had to reboot PC laptops several times in past because kept getting firmware password wrong, as was using non US keyboard. With PC you get unlimited tries, you just have to reboot after 3 wrong tries. And why was I ever apprehensive about registering a new apple device and fearing foregoing privacy with each new device. Come to find out a tech brain super think tank of a company like Apple can’t even identify the new owner / first owner of a device without the original PAPER receipt!!? Haha. So initial registration of that device is really just to transfer data and of course enjoy all that iTunes has to offer but that’s it!!?? – maybe point of decive sale / time and date of purchase from authorized seller relative to the registration date of that device by its new owner who probably did not pay cash but rather plastic. . . Am I getting close to solving one of apples problems? Cause my invoice is already in the mail. . Gotta raise capital for a new UNLOCKED mac air – that’s 3 hole punched. that way I can keep it in my trapper keeper with all my other data, notes and receipts still on PAPER! So anyone have a solution for this. ? Hey Terry, your problem is probably related to a defective Hard drive cable and/or a defective Hard Drive. Hi I am in the same situation as most of the people above. I bought an iMac 2nd hand and the previous owner had installed Windows 10 as the operating system. I wanted to reset it and install OS X so I thought it was a good idea to format the drive so I can do a clean install. I confess I saw the warning on file vault but since I knew I was formatting it I went ahead and formatted the drive. Now I am learning about the firmware lock the hard way around. Doesn’t help I am in Rwanda and the original buyer is in another country. If anyone finds a solution please post. David at Rabya dot biz. Boot up your Apple computer while holding the option key. You will get the screen wanting the firmware passcode. Press Shift + Control + Command +Option + S at this screen. You will get a one time hash code. Call 1-800-275-2273 and tell them you have the has code and they will email You a file to put on a FAT formatted flash drive. Turn you computer off boot with the flash drive in while holding the option key and that should do it. Apple may require proof of purchase to do this. On 2010 and older macbooks the RAM trick works just fine. But 2011 and newer requires either having a utility to rewrite the efi chip, have apple unlock it, or replace the efi chip with another programmed one. I always replace the chips and it works great. How are you able to boot from USB when it’s required the firmware password in order to boot from alternate drive? Don’t know if his will help those with a forgotten EFI password, but here’s what happened to me. I am the original owner and am getting ready to sell a mid-2014 mbp. Backed up all my stuff, did the Cmd-R boot and set install a new version of he OS. It worked well and created a new home directory and all that. But there was still gigabytes if used data in the machine. I went into the Cmd-R reboot again and accessed the disk utility and erased the drive. A few hours later I thought I would do the Cmd-R on the old machine to ensure I had a clean OS on it and all of my data was gone. I did the install OS command and it downloaded the OS from the internet and rebooted. Then it presented me with the firmware lock, which I had never set. I entered the admin password I had used. No luck. I entered my iCloud password. No luck. Then I thought about it and entered 123456. It unlocked the firmware password. Phwew. So, for those of you locked it, log into iCloud on a different machine. If the old machine is still listed in your list of devices, erase the machine. It will ask you to enter a code. Then try that for your firmware password. No idea if this will work, but that’s what happened to me. Anybody tried this ?? Any luck ?? Has anyone been able to sort this out? Unfortunately been a victim of a crook and bought myself a second hand locked MBP. I filed a police report but they were not even able to tell me if it’s been actually stolen. Apple is useless won’t help except tell me I should buy second hands only from Apple resellers… how convenient. One of these days they should be sued honestly as this is BS. I asked them to inform the “original owner “ and put us in contact but they can’t contact original owners: so who are they helping except themselves. The iPad stolen from me never made it back home so what kind of security is that. if *you* filed the report you would be admitting possession of stolen merchandise. The laptop will likely be confiscated. Cloning it now. Thanks for the info. So I locked my Mac after someone at my home was stealing info from it while I was out of the state. In doing that it locked my firmware too. I have tried multiple times to unlock but nothing has worked. At one point I did upgrade memory for my Mac, would make me a difference? Please help! It has pictures that I want and I hadn’t done a back up in 2 months. A MAJOR detail to be known : whatever your region/country is, the MacBook Pro 2018 boots with a keyboard in QWERTY mapping. So another trick is : translate your password in qwerty mode! My suggestion just change the motherboard. Ebay price range from $50 to $400. My MBP was working fine. I reboot into Windows 10 Pro via Boot Camp as I always did. All good until, I tried rebooting back to macOS – Mojave v14.14, via boot camp control panel – it rebooted to the black firmware lock screen. What gives, when I had NOT set firmware password. I can only boot into windows 10. It works fine as usual. Plus I can use “My Paragon” software to see all my macOS volume – ok. However, I can only read any directory or files, since the mac volume is encryption. so cannot write to it. But, I CAN copy files from macOS volume to a flash drive or to windows Boot Camp volume. so it is not a complete lockout of my MBP. I just cannot boot into macOS. Only using the Boot Camp volume. Command -r brings me to the firmware pw window as well. Is there a work a round, since I do have access to macOS through the boot cam volume?? How can I correct this without having to hunt down my purchase document, and then having to send this mac out to an Apple depot? ?